Trendy, highly customizable – and seductively sporty: The close-to-production ADAM S version showcases the hot new performance model that will top Opel’s super-cool small car family. Featuring a 110 kW/150 hp, 1.4-liter Turbo ECOTEC engine, sports-tuned suspension, OPC braking system and distinctive ‘Red ’n’ Roll’ styling, ADAM S impeccably blends punch and power with zestful, sharp-edged responses. The ADAM S is making its public debut on the Opel stand at the 84th Geneva Motor Show alongside new ADAM models powered by the new generation three-cylinder 1.0 ECOTEC Direct Injection Turbo and the new crossover ADAM ROCKS. The extended range on display shows how diverse and fun the ADAM family will look a year from now, with engine outputs ranging from 51 kW/70 hp to 110 kW/150 hp. ADAM S will then top the ADAM family as a series production model adding muscle and esprit to ADAM’s outstanding attributes as the best-connected small car on the market offering unrivaled individualization opportunities. For those looking to experience the world premiere of ADAM S, ADAM ROCKS amongst others – Opel will stream the press conference live from stand 2231, hall 2, on Tuesday, March 4, from 11 to 11.15 a.m.
With 110 kW/150 hp and 220 Nm of torque on tap, the special new version of the 1.4-liter Turbo ECOTEC unit in the ADAM S boasts a specific power output exceeding 100 hp/liter. It is a turbocharged, high performance unit derived from the ADAM’s existing four-cylinder, 1.4-liter engine, that has been exclusively developed for the ADAM S. It delivers 50 percent more horsepower and 70 percent more torque than its naturally-aspirated 1.4-liter stable-mate. Combined to a six-speed manual gearbox, it propels the ADAM S to a top speed of 220 km/h. ADAM S’s 1.4 Turbo engine includes dual cam phasing for continuously variable valve timing and a turbocharger integrated within the exhaust manifold for reduced weight and compact packaging. Numerous weight-saving features include a cast iron block with a hollow frame structure, hollow-cast camshafts and a plastic intake manifold. Start/Stop technology is naturally fitted, and the engine already meets the future Euro 6 emission standards. More power is just part of this pocket rocket’s appeal – it also has a specially-tuned performance chassis developed exclusively for the ADAM S and direct, sharp performance steering to match. The car displayed on the Opel booth also reveals how stopping power is increased with the installation of larger OPC performance 'S' Red Brakes including 16-inch front and 15-inch rear discs featuring red-painted calipers. The 18-inch wheels are fitted with 225/35 R 18 tires. The ADAM S at the Geneva Motor Show gives further impressions of features from the future production version. Its red body paint is mated with an anthracite grey roof enhanced by a special rear spoiler; the grille brand bar and door mirror caps both feature a sporty carbon-look. The front lip spoiler, side sill moldings and an extended rear bumper cut-out with a visible, bold exhaust tailpipe complete the ADAM S livery. The cabin features front Recaro Performance seats in Morrocana and leather and adopts ADAM S’s unique Red ’n’ Roll design theme. It consists of a leather pack, including a red leather-trimmed steering wheel, gearshift and handbrake as well as distinctive red and white flashes on the instrument and door panels. Many further refined details allow for more individualization. 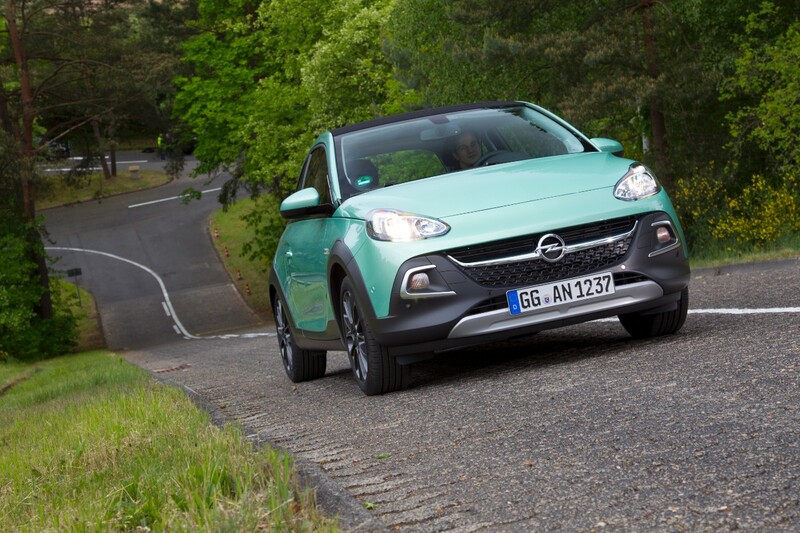 The close-to-production ADAM S version also has black rear privacy glass, LED daytime running and rear tail lights, electronic climate control and Opel’s award-winning, sophisticated IntelliLink system that offers state-of-the-art connectivity and apps. This infotainment system is fully compatible with latest smartphones using both ANDROID and Apple iOS. It provides USB and Bluetooth connectivity, audio streaming, seven speakers and a 7-inch high-definition color touch-screen. Opel’s smart IntelliLink system also provides navigation by the BringGo app, as well as the Stitcher and TuneIn apps. The integration of Apple iOS devices into the system enables use of the SIRI EYES FREE voice control function. It’s safe and easy-to-use technology which makes ADAM the best connected small car on the market.